AUCTION DATE: TUESDAY NOVEMBER 3, 2015 @ 10:30 A.M.
Ceruti mdl. AT100 Horizontal Boring Mill s/n 11954 w/ 12-1200 RPM, 43” x 51” Rotary Table, Power Feeds, 4” Spindle, Arbor Support. Bridgeport Vertical Mill s/n 32359 w/ 1Hp Motor, 80-2720 RPM, Power “X” and Knee Feeds, 9” x 42” Table. Tree mdl. 2UVR Vertical Mill s/n 40560 w/ 60-3300 RPM, Power Feeds, 10 1⁄2” x 42” able. Milwaukee Kearney & Trecker mdl. 205 S-12 Universal Mill w/ Universal Vertical Milling Head, 150-2400 Vertical RPM, 25-2000 Horizontal RPM, 50-Taper Spindle, Power Feeds, 12” x 56 1⁄2” Table. Cincinnati “Hypro” 62” Bridge Style Vertical Turret Lathe s/n 7133 w/ 5-Station Turret on Rigid Head, Boring and Facing Head, 2 1/8 to 58 RPM, Power Feeds. Bullard “Cut Master” 42” Vertical Turret Lathe s/n 24983 w/ 5-Station Turret, Side ounted Facing / Turning Head. American 30 1⁄2” x 80” Geared Head Lathe s/n 76722-61 w/ Newall DP7 DRO, 18-1200 RPM, Taper Attachment, Inch Threading, Tailstock, Steady Rest, Indexing Tool Post, 24” 4-Jaw Chuck, 18” 3-Jaw Chuck, Coolant. Axelson No.16 16” x 102” Geared Head Lathe s/n 9762 w/ 13-1577 RPM, Inch Threading, Tailstock, Steady Rest, KDK Tool Post, 15” 4-Jaw Chuck, 10” 3-Jaw Chuck. Acra-Turn 13” x 40” Gap Bed Lathe w/ 60-2000 RPM, Inch/mm Threading, Tailstock, Indexing Tool Post, 6” 3-Jaw Chuck, Coolant. 2008 Thermotronix mdl. LSF-900-100kW 900 Lb Cap Electric Furnace s/n 081933 w/ Thermotronix Controls, 480 Volt. (2) Baker Supply Co. mdl. 900/B-6 900 Lb Cap Gas Fired Furnaces s/n’s 252, 135 w/ Pneumatic Lids. Foseco “King-Carb” mdl. C-11 900 Lb Cap Crucible s/n 23401E1. (2) Modern mdl. 1090-3000-2-003-9 1.5 Ton Cap Ladles. Mulbaro Sand Mixer s/n MB317216508. Hendley & Whittmore Power Forming Roll w/ 7” Rolls. Hermann Kolb mdl. HK63 18” Column x 48” Radial Arm Drill s/n 7765/1952 w/ 14-1400 RPM, Power Column and Feeds, 48” Rotary Table with 80” Top Fixture Plate. Tominaga / YMZ mdl. 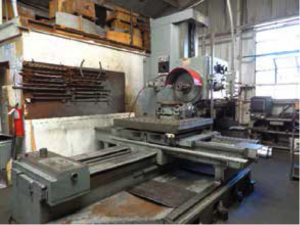 RH-1225 12” Column x 36” Radial Arm Drill s/n 80128 w/ 40-2010 RPM, Power Column and Feeds, 20 3⁄4” x 29” Compound Fixture Table, Troyke 24” Rotary Table with 48” Top Fixture Plate, Coolant. DoAll mdl. 36W 36” Vertical Band Saw s/n 31-601958 w/ Blade Welder, 30 1⁄2” x 36” Table. Craftsman 12” Vertical Band Saw. Rutland 7” Horizontal Band Saw w/ 4-Speeds, Coolant. Cincinnati 16 Royal Bench Model Drill Press w/ 4-Station Turret Assy. Craftsman 4-Speed Pedestal Drill Press. Kelco 60”W x 20”D x 56”H Dry Blast Cabinet w/ Roll-In Table. Famco No. 3 Arbor Press.